Holy Communion has a fuller form as a sign when it is distributed under both kinds. For in this form, the sign of the Eucharistic banquet is more clearly evident and clear expression is given to the divine will by which the new and eternal Covenant is ratified. In one episode of the comedy TV series Only Fools and Horses, Trigger - a street cleaner - is awarded a medal by the council for using the same sweeping brush for twenty years. Trigger holds up the brush and proudly explains, “Maintained it for 20 years. This old broom’s had 17 new heads and 14 new handles in its time.” As one of his friends immediately asks, “in what way is it the same brush then?” Maybe a similar question can be asked about the human body. If you think of your own body when you were a small child and compare it to what you look like now, it’s quite clear that your body has changed quite a lot. As well as looking different, a huge proportion of your body’s cells will have died and been completely replaced. So what makes you the same person? What makes you, you? When we come to look at the Real Presence at communion, it can be useful to have these questions at the back of your mind. In philosophical explanations of the Real Presence it’s said that Jesus takes everything that makes him Jesus, and fills the bread and wine with himself. 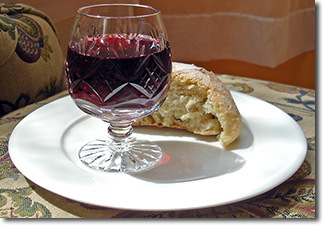 The bread and wine then become Jesus. In that way, Jesus can meet us physically as well as spiritually. We’re physical beings as much as we are spiritual. When Jesus was on earth many people were healed when he physically laid hands on them. We also, as physical beings, need his healing touch. That happens at communion. Faithful to the Lord’s command to his disciples to “Take and eat,” “Take and drink,” the assembly completes the Eucharistic action by together eating and drinking the elements consecrated during the celebration.